So I purchased all the ingredients for my homemade brush cleaner from the Dollar Store and scotch tape duos are $1.00 too. Well, this is what happens when you have a little extra $$ in your pocket. 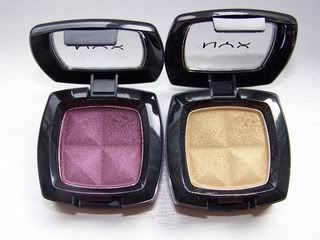 A wonderful girl from MUA RAOK'd me some NYX e/s because she cant make them 'work'. I keep telling her to reach outside her comfort zone but its not working. It was under $15.00 before taxes... I am really curious to try them out and so glad that he really listens to me when I talk about what I like and admire from afar. It will totally be nice to get some more $$ into the house and get the kids a little more leisure $ for movies and McDonalds. We are all relieved to say the least. I guess I will have to make a new one and do a little tutorial on it?? Things to do that distracts you from wanting MORE MU!!! Ok thats all I got for now.... I have too many fndts but I am really happy with my highlights and I use different concealers for under eye, blemishes and acne scars. my FOTD for the day too - I even ventured outside with all that e/s on.